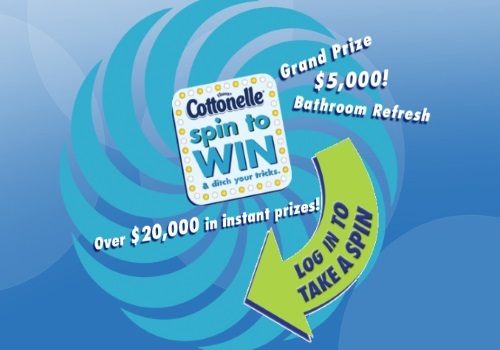 Cottonelle has a fun Spin To Win Contest! Enter to win a $5000 bathroom remodel, or 1 of a possible $20,000 worth of instant win prizes including 75x 1 year supply of Cottonelle, 1750x 4 packs of Cottonelle, 2000x Moist Wipes travel tracks or even gift cards! Contest closes July 3, 2016. Quebec is excluded. Limit 1 registration per person, 3 spins per day, per person. Received my 4-pack this week, much appreciated. We go through a lot as my granddaughter (who happens to have autism) is constantly dropping whole rolls of TP into the toilet! I only got to spin it two out of 50 times- did not work properly for me. i won cottonelle products for a year. i received 84 rolls of toilet paper.is that the total prize? received 84 rolls of toilet paper. is that the total prize for winning products for a year? I guess? Contact Cottonelle about that please, I don't administer the prizes nor do I send the prizes.